Whether you shop online or at brick and mortar stores, the merchandise you buy has spent time in a warehouse. Workers there get the goods from those facilities, which are also known as distribution or fulfillment centers, to stores or directly to your home. As of 2016, over two million Americans worked as order fillers, the official title the U.S. Bureau of Labor Statistics gives to warehouse workers who receive, unpack, and track merchandise. One-third of jobs in this field are part-time. Individual employers use a variety of job titles for this occupation including fulfillment representatives, fulfillment associates, warehouse associates, order pickers, or order pullers. These warehouse workers check in items, inspect them for damage, and then, after retrieving customers' orders, prepare them for shipping to their destination. They often use handheld RFID scanners to do their job. Order clerks earned a median annual salary of $23,840 and median hourly wages of $11.46 in 2016. While employment in this occupation is only expected to grow as fast as the average between 2016 and 2026, according to BLS predictions, job prospects are quite good. There should be nearly 270,000 more warehouse jobs of this type by 2026. What Is It Like to Be an Order Filler? Warehouse jobs are not the right choice for low-energy individuals. Order fillers must move very quickly during their round-the-clock shifts. Since warehouses are often open around the clock, they may have to work during the day or overnight, weekends and evenings included. Workers at most of the major employers typically have shifts that are between 10 and 12 hours long, during which they spend time on the feet, either standing still or moving around the facility. Those applying for these jobs should be prepared to lift heavy items, some weighing as much as 70 pounds, depending on the facility. This heavy lifting contributes to this industry having a higher rate of injury than others. Warehouses are very noisy places, but order fillers can wear equipment to protect their hearing. Temperatures in distribution centers can be extreme. Workers who spend time on loading docks may be exposed to very hot or very cold weather, depending on the season. They must dress accordingly. Fortunately, the dress code at these facilities is very relaxed so workers can be comfortable during their shifts. Now let's look at five companies with the top warehouse jobs: Amazon, Walmart, Target, Home Depot, and Staples. Each of those employers has many facilities located around the country and job openings are plentiful, so no matter where you live, you may have a good chance of finding work. According to each company's website, benefits are generous, and every company offers employee discounts. Mega internet retailer, Amazon, has 70 fulfillment centers located around the U.S. Full-time, seasonal, and seasonal on-call jobs are available. You can find listings and online applications for fulfillment center jobs on the company's website. Amazon trains their fulfillment and warehouse associates in a variety of jobs. The company boasts they have a safe work environment. Benefits include health care benefits "starting day one," a 401(k) with company match, paid time off, flexible schedules for students, maternity and parental leave, and holiday and overtime pay. Walmart has the highest number of distribution centers of all the companies listed here. There are 150 of them around the country, sending merchandise to stores, members-only warehouse clubs, and directly to customers' homes. Search for jobs and apply online on Walmart.com's Distribution Center Jobs page. Walmart hires loaders, who maintain freight flow; unloaders/processors, who label shipments, manage freight deliveries and maintain receiving equipment; and order fillers, who process orders, stack freight, and label shipments. The company offers health insurance to employees and dependents, vision and dental plans, educational assistance, and a 401(k) and stock options. Target hires full-time, part-time, and seasonal employees to work in its 39 distribution centers. These warehouse workers receive and process freight, move and manage inventory, and load items onto trucks to be shipped to stores and customers. 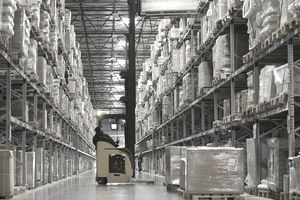 Search and apply for hourly distribution center job openings on Target.com. The company offers a variety of benefits. They include medical insurance; dental, vision, and prescription drug coverage; "well-being education;" a 401(k); tuition and GED reimbursement; and parental leave. Home Depot has over 70 warehouses that distribute merchandise to their more than 2,000 stores around the country. Warehouse associates load and unload items and pull orders. They are trained to operate forklifts. Find job listings and apply for work on HomeDepot.com. Home Depot offers employees merit pay increases based on their performance. Benefits also include medical, dental, and vision plans; a 401(k) and stock purchase plan; tuition reimbursement; vacation and other time off. Staples hires warehouse associates to work at its 30 warehouses. They are responsible for getting products to stores and customers' homes. Associates participate in physical inventories and perform basic housekeeping tasks in the warehouse. They may operate machinery. Go to Staples.com to search for Supply Chain Jobs. Benefits at Staples include health, disability, and life insurance; mental health, legal, and financial counseling; adoption assistance; a 401(k); and paid time off. How Often Do People Change Careers?